What is the brain's function? What are the main cognitive functions? Why do we use brain functions? Get access to clinical exercises. Explore fundamental brain functions. Help to improve cognitive skills and brain functions. Give it a try today! The functions of the brain as part of the Central Nervous System (CNS) is to regulate the majority of our body and mind purpose. This includes vital functions like breathing or heart rate, to basic functions like sleeping, eating, or sexual instinct, and even superior functions like thinking, remembering, reasoning, or talking. In order to carry-out any seemingly simple task, our brain has to perform thousands of processes to ensure that we properly complete the task. Proper brain function is the key to a healthy life. 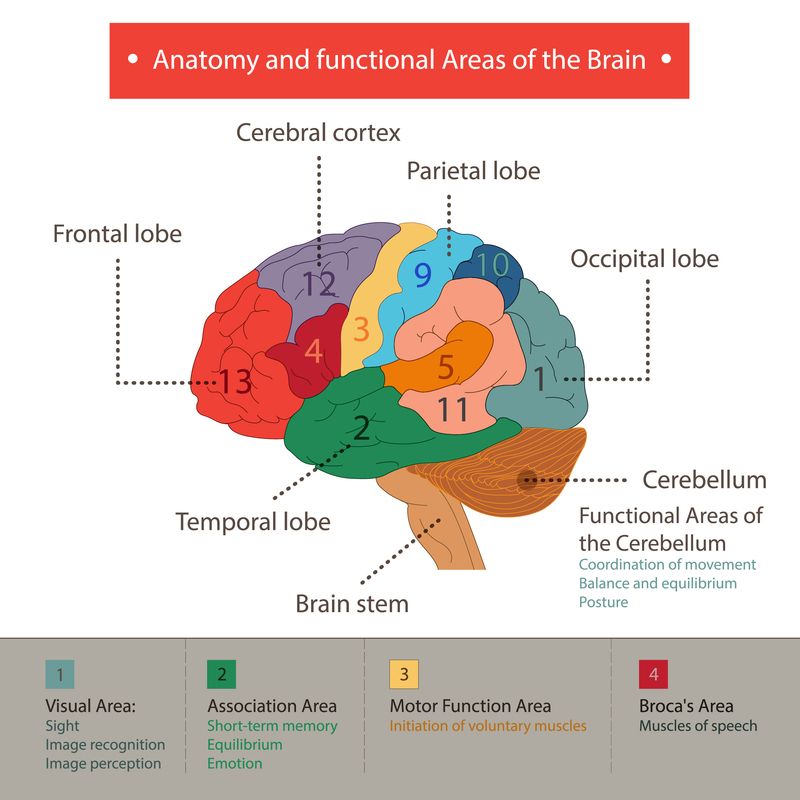 On our parts of the brain page, we mention that basic vital functions are measured by the oldest brain structures. In other words, the structures located in the hindbrain (medulla, pons, cerebellum), and in the midbrain. However, superior brain functions, like reasoning, memory, and attention, are controlled by the hemispheres and lobes that form part of the cortex. Cognitive functions are the mental processes that allow us to receive, select, store, transform, develop, and recover information that we've received from external stimuli. This process allows us to understand and to relate to the world more effectively. We are constantly using our brain functions - It's impossible to do anything without using at least some of our cognitive functions. For example, Do you want breakfast? Thinking about starting a book? Do you have to drive anywhere? Are you having an interesting conversation with your friends? ATTENTION: Attention is a complex mental process that cannot be reduced to one simple definition, one concrete anatomical structure, and that cannot be assessed by one single test as it encompasses diverse processes. To simplify, attention is the cognitive or brain function that we use to select between stimuli that reach our brain simultaneously, both external (smells, sounds, images...) and internal (thoughts, emotions...), that are useful for carrying-out a mental or motor activity. In reality, it is a whole set of processes that vary in complexity and allow us to carry-out the rest of our cognitive functions well. Attention can broken into different types depending on its complexity. FOCUSED ATTENTION: Being alert. The ability to respond to a stimulus. SUSTAINED ATTENTION: The ability to hold attention during a period of at least 3 minutes. It is was we more commonly call "concentration". When we read a book we are concentrating. SELECTIVE ATTENTION: The ability that allows us to maintain attention on a task and inhibit distractions from the environment around us, like background noise or activities. Following the previous example, selective attention allows us to read a book while listening to music or the TV on. ALTERNATING ATTENTION: The mental flexibility that allows us to change our focus from one task to another fluidly. For example, when we are reading and a song we like comes on, we are able to stop for a moment while we listen or sing, and then quickly get back to the book where we left off. DIVIDED ATTENTION: The ability to respond to more than one task at a time, or do two things at once. For example, when we talk to a friend while write a text to someone else, or when we talk on the phone while cooking. Reticular activating system (RAS) or arousal system: This is the state or base level of consciousness that optimizes the processing of sensory stimuli that reach the cerebral cortex. It is made up of the reticular activation system, the thalamus, the limbic system, the basal ganglia, and the frontal cortex. Posterior attention system: Permits the orientation and localization of stimuli, especially visual. It is used in perception, visual-spatial attention, the processing of new information... The main structures related to it are in the posterior parietal cortex, the lateral pulvinar, the hippocampus, and the anterior cingulate. Anterior attentional system: Allows us to direct our attention to the action. It regulated and controls the make complex cognitive tasks possible. This system makes up part of the anterior cingulate, the dorsolateral prefrontal cortex, the orbital-frontal cortex, the neostriatum, the suplemental motor area, and the ventral tegmental area. -Operative or working memory: Short-term passive storage system that allows us to work with information. For example, when we try to remember a telephone number before writing it on a piece of paper. Declarative (explicit) memory: References memories that may be consciously evoked. -Episodic: the autobiographical memory that allows us to remember concepts and events from our past. For example, where did we go on vacation last year? When did I graduate? When did I get married? -Semantic: This memory references what we've learned and our general knowledge of the world. What is the capital of France? What is a square root? The medial temporal lobe and the diencephalon are the structures associated with this kind of memory. Non-declarative or implicit memory: References subconscious memories and some skills like riding a bike or ice-skating. The neocortex, the amygdala (when emotions are involved), the striatum, and the reflex arcs. -Ability to simply and neatly start, maintain, and sequence behaviors. Without executive functions, we wouldn't be able to make it through the day. We subconsciously use these functions constantly and for every activity that we do. For example, when we go on vacation and we have to plan the trip: choosing where to go, How much time do we have and what can we do in that time? What route looks most interesting? What kind of transportation will we use to get around? Even something as simple as cooking requires executive functions: from choosing the foods and utensils we'll use, to watching the pots and pans, timing how long something has to cook, following the recipe in the right order... For example, if we have to make an omelette, we first have to put in the veggies, then whip the eggs, then cook. 1-LANGUAGE EXPRESSION AREA: Includes different areas of the cerebral cortex. - Pre-frontal area: Involved in the motivational processes of language. It is where both verbal and written communication starts (related to the executive functions). -Broca's area: Located in the left frontal lobe. It is related to speech production and spoken language processing. -Primary motor cortex: Starts the movements to start to pronounce words and movements to guide writing. -Occipital Lobe: Allows us to identify linguistic images. -Parietal lobe: In charge of integrating visual and auditory stimuli. Aside from the cortical areas, other areas are also essential for proper language function. The interconnection between these cortical areas with other subcortical structures, like the arcuate fasciculus (connects the Broca's area to the Wernicke's area), the thalamus (important for language regulation, as it connects sympathetic with expressive areas), the pulvinar nucleus and geniculate, basal ganglia, and the cerebellum (which intervenes in language fluency, rhythm, and tone), etc. VISUAL-PERCEPTIVE AND VISUAL-SPATIAL FUNCTIONS: Visual-perceptive functions are the functions that allow us to recognize and differentiate between stimuli. They help us interpret, attribute, and associate what we're seeing into known categories and integrate them into our knowledge. When these functions work properly, we are able to recognize friends' and family's faces, or distinguish between keys, a hat, and a comb. Visual-spatial functions are used to analyze, comprehend, and mange the space in which we live (whether it be in two or three dimensions). These functions include processes like mental navigation, distance and depth perception, visual-spatial construction, and mental rotation. We use visual-spatial functions when we read a map, orient ourselves in a city, or estimate distances. If the left hemisphere is dominant for language tasks, the right is dominant in perception. Spatial analysis, facial recognition, recognizing maps or objects, music processing, somaesthetic sensations, facial mimicry, and motor activities that don't require verbal control are predominantly regulated by the occipital and parietal lobes in the right hemispheres and their connections with the rest of the brain. In the course of just one day, we use our brain functions constantly. Thousands of tasks are being performed, which require milliones of complex mental calculations from different parts of the brain. Here we will show you some examples of you will use these cognitive skills and brain functions daily in a multitude of tasks. Making food is good for your brain? When you're cooking, you have to watch various pots and pans at the same time, all while attending to your guests and the recipe. Run a meeting? Properly running a business or family meeting is a complex task. It requires your brain to activate determined neural networks and brain functions related to attention, concentration, active listening capacity, response speed, etc. Fly a kite? Most people assume that relaxation comes naturally, but you couldn't do it without a few key cognitive abilities. Drive a car? Even if you're an experienced driver, getting to your destination quickly and safely requires skill, concentration and a wide array of cognitive abilities. Meet with friends? Life would be lonely without the cognitive skills that allow us to meet and greet one another.